The enigmatic, expressionless face of ‘Neuilly-Solange’ is a finely constructed composition that denotes the body as object, framed and enclosed by the tight cropping of the image. From the precise application of the lipstick, to the highly defined eyebrows to the almost, but not quite, closed eyes guarded by languishing eyelashes, this face is to be looked at. Her reciprocal gaze, however, is completely denied. The head and décolletage take on an inanimate appearance, resembling a mannequin, a motif employed by the surrealists as precipitating desire. Celebrating the female body in parts rather than as a whole is a surrealist device used to evoke the uncanny and exploit sexualised metaphors. The emphasis on the throat and chin see ‘Neuilly-Solange’ eroticised as both phallic sign and vaginal void, the tight cropping designating the phallic as both circumcised and castrated, while the cupid bow lips invert the phallic to designate the parting of the lips. Signed l.r. sheet, ink "J.H. LARTIGUE". Not dated. 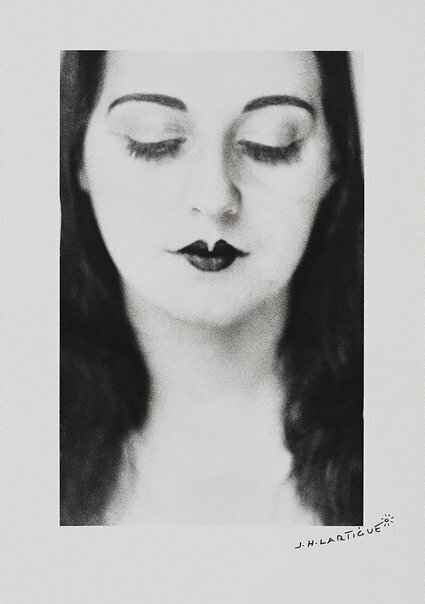 Donna Brett, Photography: Art Gallery of New South Wales Collection , 'The surreal aesthetic', pg.113-129, Sydney, 2007, 117, 122 (illus. ).